Those of you who have been following along on Instagram will know that my husband and I recently moved into quite a small house with our two young children. While we should have been up-sizing we decided to down size and up style. Having completed a small renovation we are now very happy with our little place, however with a small property comes BIG storage needs. To keep our house (and my mind) tidy I need to have a place for everything and everything in its place. Oh, and the storage itself needs to be chic! Enter: Sagitine. When Tina Clark entered the storage market with her inaugural collection of stylish and stackable shoe and storage boxes I couldn’t get enough. Not only do Sagitine’s boxes look beautiful, their stackable design and easy slide out drawer functions as the perfect solution for shoes, children’s toys and out of season clothes. Tina had certainly filled a gap in the premium storage market. I love Sagitine’s Milan shoe boxes to protect my favourite footwear and I have recently gifted a white medium box to new parents as a stylish option for storing keepsakes from their baby’s first year. Now, Tina has built on her core range with her absolutely stunning new offering – The Luxe Collection. 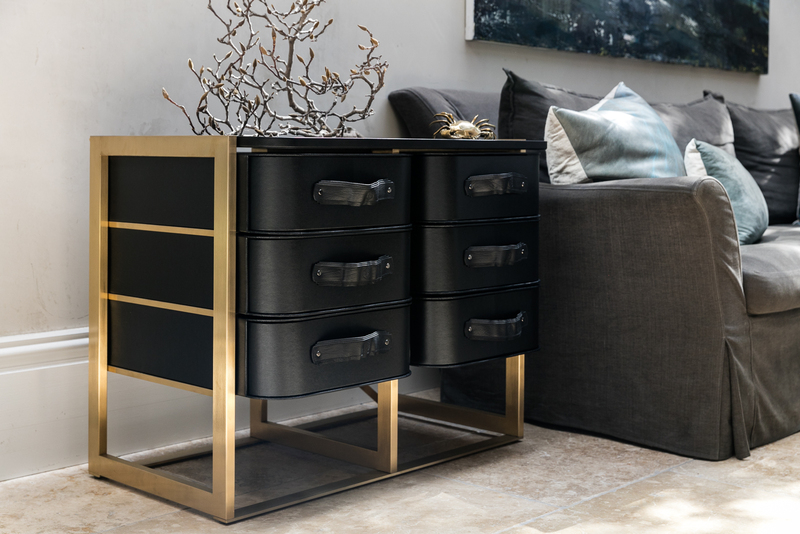 A brass-finished, stainless-steel frame meets all our hardware desires and the onyx leather top co-ordinates beautifully with the black Sagitine boxes creating a sleek and refined look. A new level of sophistication and, for me, a new level of lust! The Luxe Collection is currently available for pre-order only from now until 14 July 2017 (read: act now! ), with delivery expected in September 2017. In Melbourne and want to see the range in person? You are in luck; the full range will be shown at Denfair 2017 from 8-10 June 2017. For the shoe addicts, choose from the 14 or 20 box stand (RRP $3000 and $3300 respectively, which includes 14 or 20 boxes and the stand, fully assembled). These narrower stands also make a perfect edition to an under used corner. For larger items, try the 6 medium box stand (RRP $3100, which includes the 6 medium boxes and the stand, fully assembled) which I am eyeing off for our master bedroom. While you are thinking storage check out Tina’s expertly curated selection of wardrobe storage accessories. The Luxe Collection – keeping your precious pieces in a manner befitting their worth to you. Photos by Jacqui Turk for Sagitine, used with permission.